Browsing through a bookshop recently, I came across a large, expensive hardback titled, Director’s Cut, by John Waters (1), the celebrated director of bad taste classics like Polyester (1981) and Serial Mom (1994). Made up almost entirely of photographic stills, it’s a curious, idiosyncratic collection with very little contextualising information. Right at the back, however, is a personal essay by John Waters. Between explaining the impetus behind some of the stills and criticizing other directors, Waters infuses his piece with a demented and obsessive enthusiasm. According to Waters, about one second out of an entire film is memorable, and the sequences of stills presented in Director’s Cut are in part a way of selecting and highlighting these key frames; it’s a process that invests them with an eerie significance. Moreover, this “re-directing” of films is a way for Waters of engaging with the form of film as a fan, critic and practitioner. It is interesting that visual artists have drawn on the richness of film titles, exploring the relationship between text and image in this context, but this is not a subject that has generated much interest in the area of film criticism. Perhaps this is because film titles are considered such a minor aspect of the final film. In design books and journals, occasional articles have profiled the works of title designers, and every now and again, computer design magazines publish articles focusing on technical innovations in title design (2). Most recently, a plethora of graphics books have been published showcasing ways in which advertising, music videos and multimedia have been incorporating moving images and type. (3) Still, no discipline whether it be graphic design or film studies, has produced any sustained study of film titles (4). Waters pays particular attention to the opening credits of films, enjoying their potential for poetic effect. In one work, he has selected a frame from a credit sequence featuring the words “Mel Gibson”, which are written in a chunky, angular typeface. Waters has named the work, “Straight”, alluding simultaneously to the font and Mel Gibson’s well-publicised homophobia. In another piece titled, “Framed”, Waters has created a series of stills from Portrait in Black (Michael Gordon, 1960). This film opens with credits that feature actors’ faces framed by an ornate gold frame. Waters has a great eye for the absurd and with this title sequence, he humorously draws our attention to the spatial characteristics of the cinema screen, the way it serves as a framing device, as well as the way in which film titles frame or bracket a film. Waters’ practice – of isolating and recreating title stills – was originally intended for personal gratification. In recent years these stills, now collected in Director’s Cut, have been exhibited in the gallery context. It’s a subject also taken up by the New York based Australian artist Maria Kozic, who has produced a series of paintings that feature the words “The End”. These paintings nostalgically evoke the closing frames of old films, with their scripted letterforms superimposed over technicolour backgrounds. It’s necessary to view Kozic’s “The End” series of paintings together, to fully appreciate the subtle interplay of similarity, difference, and obsessive repetition. Like repeating a word until it loses its meaning, Kozic’s work similarly possesses an absurd and playful quality. But there is also something melancholy in these paintings, given the way in which they open up that moment when a film is over. In this respect, this series of paintings affectionately evokes the experience of watching movies. Kozic’s paintings remind me that one of the reasons I love film titles, is that I always experience a sense of intense pleasure and anticipation when the studio’s logo illuminates the screen. It’s a moment filled with promise – this encounter with the new – but also a very pleasing familiarity. Kozic’s and Waters’ film title projects give prominence to a literally marginal aspect of filmmaking and in doing so suggest titles’ multifarious meanings. Both Kozic and Waters acknowledge the highly artificial and constructed: the moment before and after the illusionary diegetic film world. Credit titles, the edges of films, are loaded things as Waters demonstrates in “Straight”. Their complex web of references extends beyond the film and into the realm of popular culture. Saul Bass, the renowned title designer, has described the role of film titles as a means of setting the tone for a film and establishing its mood. In conversation with Billy Wilder he commented on the titles for James Bond movies saying, “it [the title sequence] was the best part of the picture…if you open your mouth too wide with the titles you can only go down”. (7) Bass’ comments reveal an interesting anxiety, about film titles upstaging the film. Like the “audiovisual battle” between image and text in film titles the connection between film titles and the film is a volatile one. In Jesus’ Son (Alison Maclean, 1999), the titles extend into the film proper. The film is comprised of a series of vignettes punctuated throughout by shots of text against monochromatic backgrounds. In part these shots recall the origins of the film – a series of short stories – as well as functioning as a structuring device. Genuinely hand rendered rather than pre-designed, and on a monochromatic background, these titles with their irregular, lines suggest an unconstrained, naive quality. 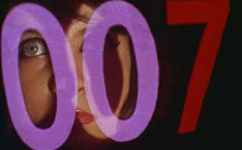 When these titles appear at the film’s commencement, they anticipate the film on several levels: its loose narrative, uncertain protagonist, as well as introducing the motif of shaking hands. Man on the Moon (Milos Forman, 1999), a biopic of comedian Andy Kaufman, acknowledges the inherent awkwardness of titles by collapsing them and the film proper. In a direct-to-camera address, Jim Carrey (as Kaufman) introduces the film, informs the audience that he has cut out the boring bits and with a record player beside him, puts on a record of orchestral music reminiscent of countless matinees. To Kaufman’s right, fictitious credits roll. When the record gets stuck, the scrolling credits also stop, comically jerking backwards and forwards as Kaufman adjusts the record. In this self-reflexive and ironic title sequence, Forman literally disrupts the apparent seamlessness of sound, text and image, and in the process examines the indeterminable moment, where things begin and end, when outside becomes inside. And this in turn, becomes a metaphor for Andy Kaufman who, as the film reiterates, purposefully blurred any distinction between his work and life. Film titles, like Andy Kaufman’s record, jerking backwards and forwards awkwardly, move between fact and fantasy, real and imagined worlds. In Waters’ obsessive “re-directing” of opening sequences, he explores the poetic and absurd possibilities of this dynamic in-between space. Here the film is in the process of becoming, where distinctions between outside and inside dissolve, and the film undergoes the difficult, exhilarating passage towards suspended disbelief. For the first time last year a two-day conference, For Openers: The Art of Film Titles, organised by the American Cinémathèque and the American Graphic Design Association was held in Los Angeles. It included an historical overview and a panel discussion with both contemporary and pioneering designers. Anna Zagala has a degree in cinema studies and graphic design, and currently lives in Canberra.